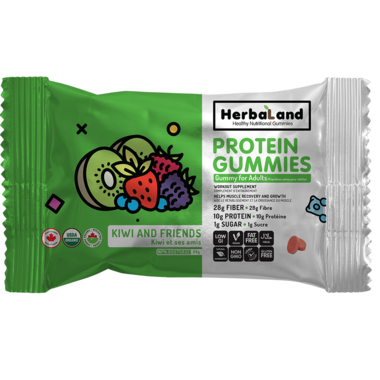 Herbaland Vegan Protein Gummies! These are nutritional gummy supplements that contain a plant based protein, the yellow pea protein. Which is a macronutrient, essential to building muscle mass and it helps muscle recovery and growth. These organic gummies are made with exceptional quality and fair trade ingredients. All-natural, non-GMO, low-sugar vegan formula! Other Ingredients: Organic Isomalto-Oligosaccharides (VitaFiber ), Organic Vegetable Glycerin, Purified Water, Natural Flavor (Kiwi, Berry), Citric Acid, Agar, Organic Locust Bean Gum, Organic Erythritol, Natural Black Carrot Color, Organic Stevia Leaf Extract, Potassium Citrate. These taste surprisingly good - one of my favourite flavours. Satisfies a sweet craving and helps you reach your protein macros if you're tired of protein bars/protein powder. Will order again! Quite tasty. Given the ingredients I think they did a great job. This isn't candy but fills a gap when craving a sweet. good thing i only ordered the small packet!